1. Talliguri Check Post Dawaguri Cooch Behar-I 10 KM. 2. Dewanhat Check Post Dewanhat Cooch Behar-I 15 KM. 3. Akrarhat Check Post Falimari Cooch Behar-I 25 KM. 4. Patlakhowa Check Post Patlakhowa G.P. Cooch Behar-II 22 KM. 5. Kholta Check Post Kholta Marichbari G.P. Cooch Behar-II 22 KM. Commodity Market Unit Price as on February (in ) . have been dissolved (vide Notification no. 1360-AM/P/5A-17/2013, Dated- 17/10/2014). 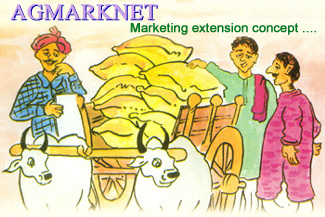 Marketing extension is a continuous process to disseminate all relevant information to the farmers, traders and consumers about various measures taken for improvement of marketing system so that they may all derive the benefits flowing from such measures. During the Third Five Year Plan, a small extension cell was set up in the Directorate of Marketing & Inspection (DMI). The Directorate undertakes extension and publicity activities to educate producers, traders and consumers. Agmark quality programmes as well as improvements in marketing practices and procedures are given wide publicity through mass media. The information is disseminated through documentaries, cinema slides, printed literatures, exhibitions, conferences, seminars and workshops. The DMI headed by the Agricultural Marketing Advisor, Department of Agriculture and Co-operation (DAC) implements agricultural marketing policies & programmes of the Government of India. The Directorate of Marketing and Inspection (DMI) is an attached Office of the Ministry of Agriculture. It was set up in the year 1935 to implement the agricultural marketing policies and programmes of the Central Government. Since its very inception, the Directorate continues to be responsible for bringing about an integrated development of marketing of agricultural and allied produce in the country with a view to safeguard the interests of producer-sellers as well as the consumers. It maintains a close liaison between the Central and the State Governments in the implementation of agricultural marketing policies in the country. Agmark products are free from adulteration and conform to the scientifically laid down principles of purity. It ensures consumer protection. Each batch of Agmark products is pre-tested for quality in well-equipped lab by quality control and specially trained chemist. Agmark products are always packed in Food grade material never to be sold loose. 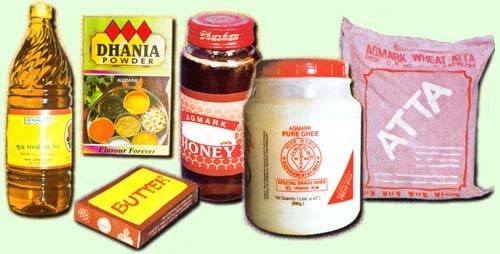 Agmark products bear Agmark label or replica as an identification mark, date of manufacturing and expiry period. Free of cost replacement provided in the rules if Agmark products are found not conforming to the quality standards. They are not mandatory, any body can use them. These are prepared by either Bureau of Indian Standards or Agricultural Marketing (ICAE).